First-in-nation law will improve fairness and accuracy of the Census data used for redistricting. Delaware is poised to follow Maryland and end prison-based gerrymandering. First of all, they’re using the last known address of the prisoner. What they don’t tell you is that prisoners usually lose their residence, be it a rental or leased domicile. It’s kind of hard for a guy in prison to make his rent payment. Second of all, if the prisoner leaves family behind, maybe they don’t want him back. Let’s say that Joe Blow ran over a family of five while driving drunk down a county road with fifty pounds of weed in the back of a stolen car. And, let’s say, he wasn’t cutting anyone in on this action. Do you really think they want him back? Why count his residence as being “his” (or hers, of course) when they don’t want him to move back in? Third, what about a person serving a life sentence? Realistically, you get life in Maryland, you’re back out in, what? Six months to a year? Why shouldn’t a life sentence in a facility count as being where you’re going to spend the rest of your life? @Norman Rogers — Regarding Points 1 and 2, under state law, incarcerated people remain residents of their pre-incarcetion addresses. The state is merely making sure that the redistricting data matches with state law. For your third point, most people in prison are serving relatively short sentences of just a few years, so your example is far from typical. But here, for most purposes, those folks would still be considered for other state law purposes to be residents of their pre-incarceration homes. But here’s the problem: Should some people in Somerset County get almost 3 times as much influence in the county commission as other residents of the county just because they happen to live next to the prison. That’s not right; and that’s why the local paper supported the bill, and why the bill received support from some of the local elected officials. Basing districts on populations counted in the wrong place isn’t fair. Anybody see a resemblance to counting prisoners in their prisons — though not allowing them to vote, in almost all cases — to the counting of slaves as 3/5 of a person for these purposes? Just asking. This is absurd, these people dont have the right to vote and if they do have the right that is as absurd! They shouldnt be counted at all!! They are in Prison! And like the gentlemen stated above. They have no actuall address! Unless they can provide two utility bills with there name on them they live in prison! No, I don’t see the point. The census is a once in ten years snapshot; most people are incarcerated for periods of less than ten years. 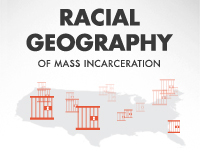 Hence, it doesn’t take into account a completely accurate view of incarcerations. If you happen to be in jail when they take the census, you’re counted one way. If you get out before the census, you’re not counted the way they should count you under the law, especially if you are a habitual offender who goes back to prison. Seems to be a lot of if’s regarding the recording eligibility of those serving time with respect to their place of residence. I think that a person ought to be counted based on their last known residence. From a Representative perspective it seems to penalize Americans who do not commit crimes against society. What we rally are talking about is the peoples voice and it ought to reflect the make up of the people. The county of sentence should be where the incarcerated persons census data is recorded in the event a last known address is not available.